Founded in 2002, 180 Medical has emerged as one of the fastest-growing home delivery providers of catheter and ostomy supplies in the nation. It’s amazing to witness the company’s growth, but even more humbling when we consider just how many people we have been able to help over the years, thanks to the solid foundation of compassion and integrity that Todd built this company on in 2002. 180 Medical, one of the nation’s premier home delivery providers of sterile-use catheters, ostomy, and urologic disposable medical supplies, is proud to announce that it is celebrating its 15th anniversary. The company was founded in 2002 by Todd Brown. The company celebrated all week long leading up to the anniversary on August 27th. The home delivery medical supplies provider has been named one of the Best Places to Work in Oklahoma multiple times. Before the company was founded, Todd Brown grew up active in sports. He loved riding his motorcycle and began getting involved in motocross. He was injured in a tragic motocross accident in 1994 and left with a T7-8 spinal cord injury. Life changed drastically for him, but he refused to give up and wanted to continue leading an active lifestyle. However, he found that, as a paraplegic who had to clean and reuse his catheters, he continued to get urinary tract infections. On top of fatigue from his infections, he grew tired of dealing with medical supply companies who didn’t understand his needs and were unfamiliar with the right options for someone in his unique situation. When he discovered sterile-use catheters and began using closed-system catheters, his health improved almost immediately. He wondered if there were others like him out there who had no idea of their options beyond washing and reusing. So, in 2002, he founded a medical supply company. Originally, its “warehouse” was in his home garage, and he began to locally supply in Oklahoma City. His highest goal was to help other people with medical needs like his and provide them with a way to turn their lives around. Today, 180 Medical is one of the largest nationally-accredited providers of sterile-use catheters and ostomy supplies. 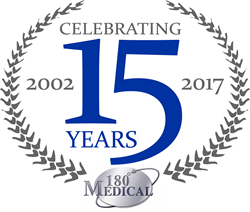 Everyone at 180 Medical would like to say thank you to all those out there who have contributed to the 180 Medical story. 180 Medical will spend the next 15 years doing what it does best: providing its customers with the best products and customer service available. 180 Medical is one of America's fastest growing home delivery providers of sterile-use catheters, ostomy, and urologic disposable medical supplies. Based in Oklahoma City, the company is dedicated to meeting the supply needs of customers with chronic medical diagnoses such as urinary incontinence, spinal cord injuries, spina bifida, colon cancer, Crohn’s disease, and many other conditions that require catheterization and ostomy supplies. 180 Medical is a subsidiary of ConvaTec, a leading global medical products and technologies company.